Platinum Rhythmz - Modern 'Radio-Ready' Hip Hop Drum Loops, Mixed & Engineered to Perfection! Download Platinum Rhythmz 1 - Finally, after extensive time & creativity was poured into this incredible drum loop collection, ModernBeats delivers simply the hottest rhythms you'll find in Hip Hop: "Platinum Rhythmz Drum Loops"! Meticulously designed, this powerful "Radio Ready" drum loop library comes packed with 200 highly unique, blazin' drum loop patterns at tempos 87BPM & 97BPM in Acidized WAV, Apple loops AIFF, & Reason REX2 formats for 500 files total. Platinum Rhythmz Collection - Download the complete collection (Volumes 1 & 2) for all 400 modern platinum drum loops provided at 4 tempos (87BPM, 92BPM, 97BPM, 102BPM) and in 3 music software formats (WAV/AIFF/REX2). That's 1,000 files total! Rhythms range widely from hip-hop roots to crunk classics to never heard before jaw-dropping patterns! With 4 variations for each of the 50 loop themes included (source beats, breaks, mutes, drops, fills), you can effortlessly create professional productions with longer phrases without having monotonous drum rhythms! 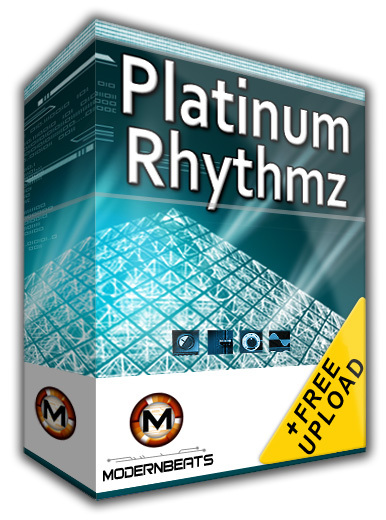 With "Platinum Rhythmz Drum Loops" you aren't confined to only one or two patterns per style like most loop libraries. Now, equipped with the ModernBeats standard, you can build blazin' beats fast with access to 4 variations per rhythmic pattern! Download the amazing "Platinum Rhythmz" drum loop collection (Volumes 1 & 2) to propel your music into another dimension! Raise the standard, demand the best: "Platinum Rhythmz is a must have, without question!"